Burnett Medical Center employs 6 full time lab employees who rotate working daily shifts along with evening and weekend call to provide 24 hour coverage. The lab performs approximately 4000 tests per month in disciplines of microbiology, chemistry, hematology, urinalysis, blood banking and serology. Many tests are performed in house, some specialized testing is sent to a reference lab with results returning in as little as 24 hours. Recently, Burnett Medical Center acquired a Vitros 5600 Chemistry Analyzer for the lab (pictured above). The Vitros 5600 is a state of the art, integrated analysis system combining the workload of many laboratory instruments on to a single platform. This integration provides greater efficiency, productivity, and testing capacity. The analyzer can perform over 120 different assays, providing Burnett Medical Center physicians more diagnostic information in less time. 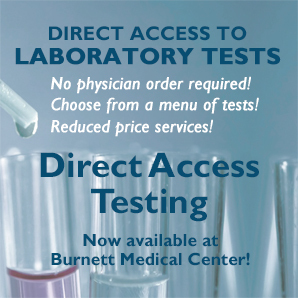 BMC's Laboratory Department now offers Direct Access Testing. Direct Access Testing allows you to choose the lab tests you would like performed, at a reduced price, from a select menu of tests. An order from your provider to receive a test is not required. Your insurance will not be billed for these services; payment by cash, check, MasterCard, Visa, or Discover is required upfront before tests are performed. The lab also hosts a student externship from Rasmussen or Pine Technical College for their MLT programs. 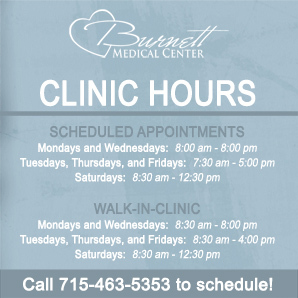 Please contact Tammy Kraft, Lab Manager, at 715-463-7273 or by e-mail at tkraft@burnettmedicalcenter.com.